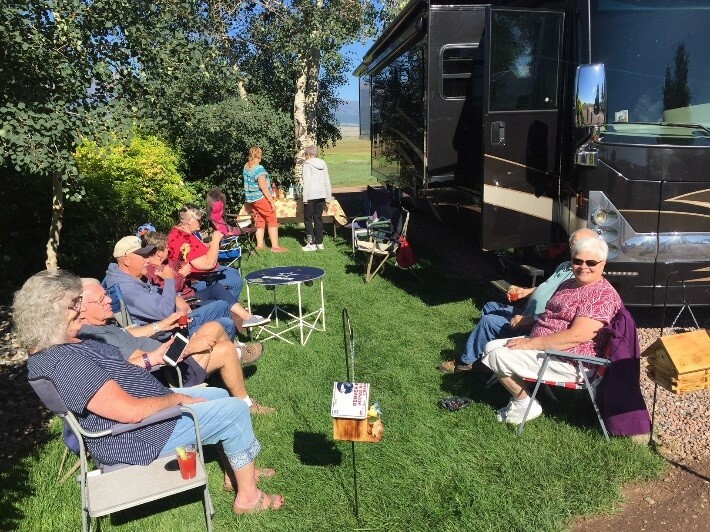 The Pikes Peak RVers group can trace its origins back to the 1970s, was solidified in its current form in the early 1990s and formally joined the FCRV family in 1993. We are located in and near Colorado Springs and currently consist of approximately 15 couples of adults and retirees. We have a sizable percentage of retired military members as well, and will be changing to a Retiree only group next calendar year. We are welcoming new members. We plan our campouts from April to October, on the second weekend of the month, with most folks showing up on Thursday and going home on Sunday. This year we will be camping in La Junta, Salida, Ft Collins, La Veta, Westcliffe, Buena Vista, and finally Penrose/Canon City. Next year (2020) we are planning to camp in Santa Fe, and the Palisade Peach and/or Wine Festival. We normally plan a hors d’oeuvres/finger food meal on Friday nights, so everyone is not scrambling to prepare a full meal on the first night. We take group outings, or split up and go our separate ways on Saturday, but come together in the evening for a potluck meal, meeting and games. We currently have bumper pull, and fifth wheel trailers as well as class A motorhomes, and prefer RV parks with hookups. 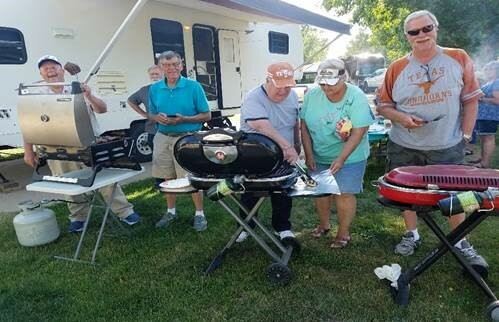 One or more families volunteer to host each monthly event and arrange optional activities such as potlucks, games, and dinners out. 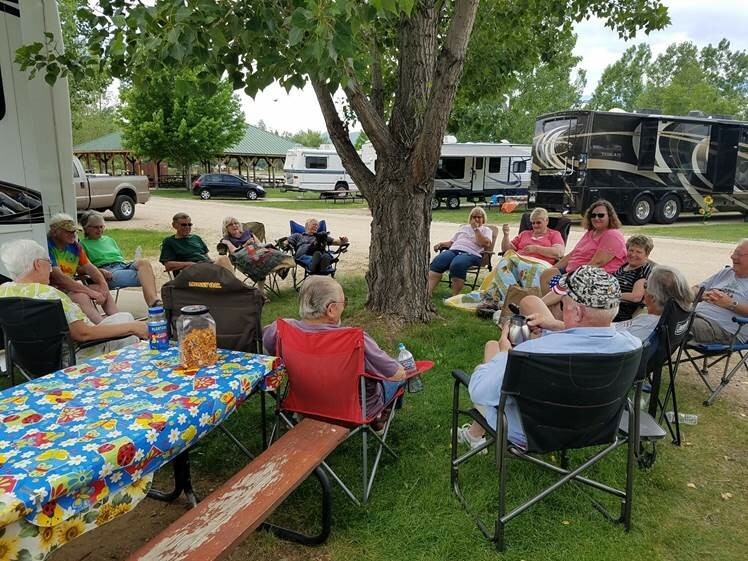 We allow younger family members to camp with us, and usually have at least one set of kids or grandkids on our campouts. Many of the women in our group are quilters/sewers, and get together for those activities on most events. 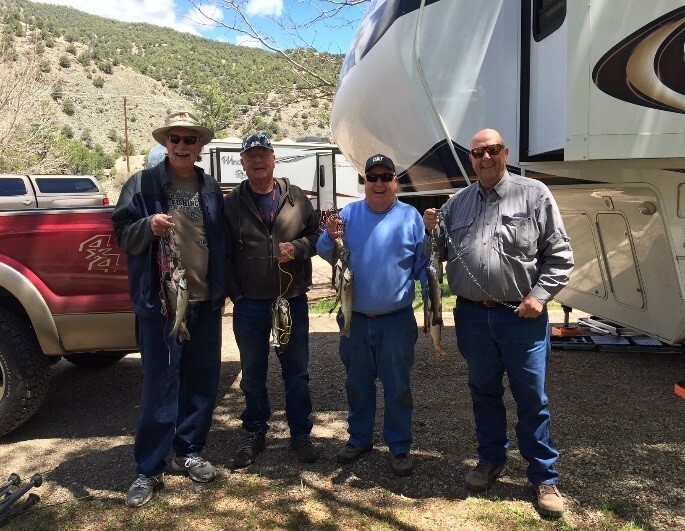 Most of the men are fishermen, and we go fishing once or twice during our campouts. The fishermen range from expert fly fishermen to novice bait and lure fishermen. It’s really about friendship and being one with nature that gets the guys out on the various lakes, ponds and rivers near our campground. On the non-camping months, we get together for lunch or dinner, have monthly men’s breakfasts and women’s luncheons, and in December have a Christmas Party with white elephant gift exchange. We use these events to hold our monthly meeting and discuss/plan next summer’s camping activities.